If you are like me, you love beautiful jewelry. When a friend asked if I would mind helping out her friend with promoting her new etsy store making this gorgeous porcelain jewelry, I took one look at the picture above and knew that this giveaway would sit well with me here at sewpony. ASH Jewelry is a brand new brand, with all the beautiful jewelry designed by Ashlee. She makes all these pieces herself from clay and glaze. You can read all about the making process here. Yep, I love her stuff! Ashlee is offering one of my readers a super generous gift: a $65 (US) voucher to her online etsy shop. Ashlee ships internationally. To enter, simply follow the rafflecopter widget below...I wish I could! Giveaway ends in three days time - at midnight on 17th December. The winner will be announced on my facebook page. Thanks Ashlee!! And I hope your new business is a great success!! Please note: This is not a random draw competition. I will choose the winner. The tiny star necklace - my precious!! Love the tiny star necklace! I love the rectangular stud earrings! difficult choice! Love the blue and gold triangle pendant. the triangle pendant! amazingly beautiful jewelry...all of it! 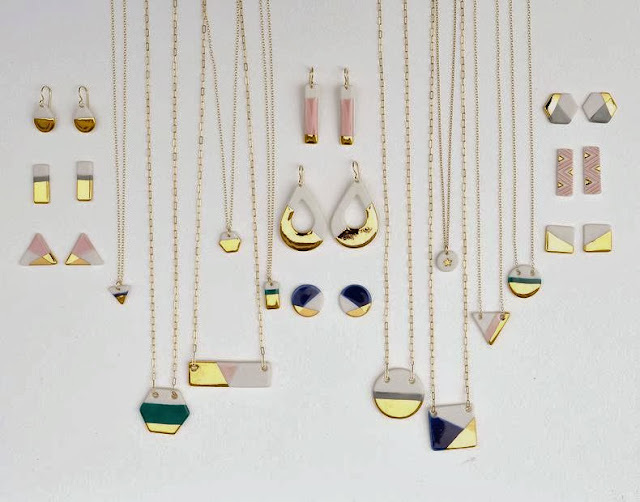 I think I'd go with the tiny porcelain star necklace, or the gold dipped porcelain drop earrings. I love every piece! Especially those hexagons! Gorgeous! Ohhhh... Just discovering this now!!! Totally love this jewelly!!! The pink and gold square necklace is beautiful!